I spoke with a gloomy friend on the phone a few weeks back, when the lilacs were first out. Nosing lilacs gives me shiver-thrills. It's the scent equivalent of listening to Wilda's purr, a direct drink of comfort and joy. 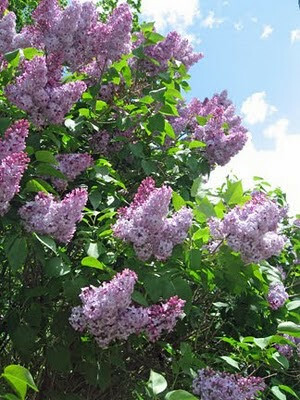 As we were ending the call, I said, with a touch of the Mary Sunshine Cheer Up Vibe that sets my teeth when I'm grumpy, "Well, I hope you at least get to smell the lilacs sometime today!" "Uh, yeah..." he said, sounding dubious. "Don't you like lilacs?" I asked, relentlessly peppy. "It's just that I'm deathly allergic to them. If I smelled a lilac directly, I wouldn't be able to breathe, at all." "Oh. So basically I was signing off with a curse--I hope you at least get to suffocate sometime today. Not exactly what I meant...."
"I know what you meant," he said, with just a hint of a smile in his voice. Here's a first attempt at a video, of Herself, purring.